DiS is a little pensive. Sitting by the phone, agitated, waiting to be called by Rivers Cuomo, legend and hallowed song writer of arch popsters Weezer, it's a squeaky bum-time kinda moment. Our mood is not helped by the fact that Dev ‘Lightspeed Champion’ Hynes has just come in and squealed like a molested schoolgirl when we tell him what we're up to (interview). The reason for this chat? 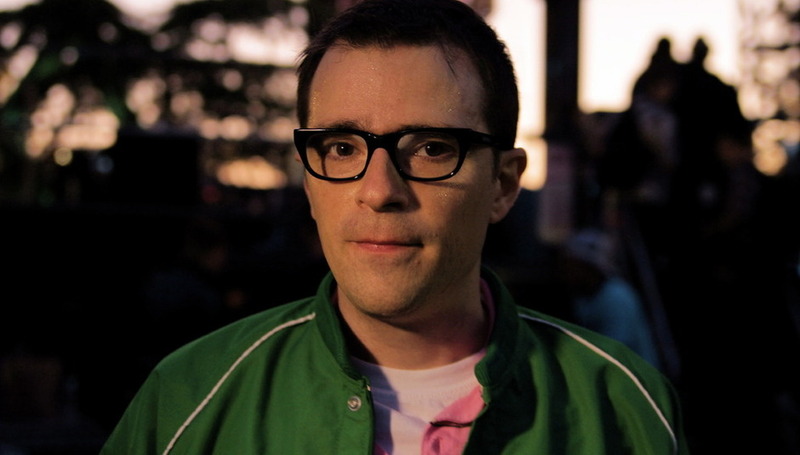 The release of Rivers' collection of home recordings from both before and during his Weezer career, titled Alone – The Home Recordings Of Rivers Cuomo, hence our use of an old-school Rivers on the phone picture taken from the inlay of the record. See? Naturally, though, it's a chance to ask him about Pinkerton and (the fabled but never released) Songs For The Blackhole record, as well as a load of, frankly, stupid and pointless (as well as funny) questions posed by you, the DiS readers. The phone rings and a snippy sounding Geffen Records exec in LA tells us that we should be keeping Weezer questions “to a minimum” and focus talk on his demos and disregarded tracks. Ho hum. To be honest, the music exec-style chaperone only leads us to assume that Cuomo will be a massive fruitcake and that knot in the stomach tightens a little more. We're then told that we're “on the line to Rivers” and away we go. Well, we’ll just stutter along together, then. No, I’m nervous for another reason. This weekend I am going to play in a celebrity soccer match alongside some of the best American players: Landon Dononvan, Alexei Lalas, Cobi Jones, Mia Hamm. Amazing! How did that come about? Left wing – I’m left footed. Can you still get to the byline and cross it in? I’ve been seriously running on the treadmill for the last few days trying to get the speed back. You’ll probably be better than Alexei Lalas – he hasn’t played in years. (Doubtfully) We’ll see. I’m so excited though, it’s a dream come true. Alright, back to the football then. Do you watch the premiership? I watch it on TV, but I don’t really follow it – I don’t know what’s going on in the league. (DiS explains that it’s nothing to worry about… the same teams finish in the top four every season.) I watch all the Americans in the league though – that’s why Fulham are in trouble! Right, but I have to ask you some record questions. Why release Alone now? I always wanted to release my demos. I love the special intimate qualities that they have, that you don’t get on a real record with full production. It just took me this long to build up the desire, I guess, to push the record company to make it happen. I thought the record company would be keen to put out as much Weezer / Rivers material as possible? But you’ve got a new Weezer record coming out in a few months. Yeah, the first priority is the Weezer record, so the record company and Weezer’s manager were very careful to put Alone out at a time when it wouldn’t hurt Weezer in any way and hoped that it would actually help by bringing awareness back to Weezer somewhat. It sounds very autobiographical – especially with the songs in such stripped-down forms. They’re very bare, quite naked in a way. I don’t think more so, but maybe, because it’s me playing everything – you don’t get the influence of the other guys. And I’m not saying that’s better, it’s just different. And I know from my point of view as a music fan, I would love to have an album like this from an artist I admire. It’s not intended for the general public – it’s for people who are really interested and want a glimpse behind the scenes. Obviously Weezer has a strong fanbase and you’re pretty intimate with them, with your website and the MySpace, et cetera. Is this a way of cementing the relationship with them? I’m very happy with that relationship. Like I said, it’s something I’ve always wanted to do and I’m just thrilled that I can get this stuff out and it’s in the stores. It’s so cool. When you revisited these songs, what was your take? Proud? Nostalgic? A wry smile? It was a combination of all of the above. Some of what I’ve done on my own is really embarrassing. Some of it is really touching. It’s like looking at old pictures of yourself through different phases of your life. ‘Longtime Sunshine’ – one of my favourites – is quite doleful and nostalgic. Do these tracks mark a specific period of your life? Can we tell how you felt at these points through them? Or are they just a creative outlet? Absolutely. Most of these songs perfectly capture how I was feeling at the time and ‘Longtime Sunshine’ I described in the liner notes [on the record]: I was feeling really lost in where I was in my life and wanting to go back to a simpler time, more innocent time, my childhood. I’ve only been given a digital copy – I haven’t read any of the liner notes. Heh, yeah, so maybe it’s better this way. (Long pause) I’m obsessed with the past, too. (Laughs) I love these old recordings, so I’m happy to share them. Uh… It is interesting how… how many people have a special connection to a certain period of the band. I wouldn’t say I’m worried about it, but I’m aware of it; I’m intrigued by it, and I’m listening. I don’t know what to make of it at this point. You’re one of those bands where people develop such a love… they’ll follow you through thick and thin. Maybe people connect with you on a certain record and that sticks with them, and that period will always be their favourite. That’s my opinion. According to lore – well, Wikipedia – you’ve written 800 songs. Is that accurate? I don’t really know… I’ve started many songs and not finished them – what counts as a song? If you consider I’ve been writing since I was 15 – that’s around 20 years of writing so that makes… I’m horrible at math. 40 songs a year? That’s a song a week. You make that sound so normal. Maybe you have a higher work rate than other artists? I like writing. I really dig it. Is it an outlet for you? At this stage, it’s just fun. I don’t know if I have to do it, I haven’t forced myself to try to stop, but it feels like just a fun activity. I just go to my workshop and start making lists of ideas – “what do I want to do today?” It’s just fun. I take a lot of time off! I definitely don’t feel like I’m a slave to any kind of machine. I rest when I want to rest. I do plenty of other things, too. How do you edit your work down? On this album, you had to find 18 tracks you were happy to put out. Is Alone a coherent record? Or just a list of songs you were most happy with? It’s a combination. I narrowed it down to eight hours and gave those hours of music to a number of friends and associates and then we all voted. From there, we all came up with a smaller pool of our favourite songs. And from there, I worked with one other person – our A&R person – and we took that smaller pool and narrowed it down some more and put it in that sequence where we felt it was telling a story and had some kind of development to it. Yeah, we tried to make the best album out of what we had; it wasn’t a matter of picking hit songs or anything like that, it really had to tell a story and show some development and some different sides to what I’ve ever done. The message on the Weezer site announcing the release of Alone implied that there may be more volumes of demos coming out in the future. Is that likely to happen? Yeah, I’d like to release one more. Based on the feedback I had from those people listening to eight hours, I think there’s at least one more CD of somewhat commercially viable material. One day, in your dotage, would you like to release the full eight-hour anthology? If there’s a way I can shape the material in a way into something that’s compelling to me, then I would release it. If it’s just not that great, then I wouldn’t like to release it. One of the tracks off the album, ‘This Is The Way’, was a track in consideration for the new Weezer album – is it a reflection of the new record? No, it’s what the record is not going to sound like. We chose not to do that, and went a different direction instead. Well, once the band got a hold of it, it would have ended up sounding like more traditional Weezer, anyway. Right, here’s a few questions from some DiS messageboarders… you ready for some stupid questions? Have you ever met a girl who shreds cellos? Have you ever got jealous of Joaquin Phoenix’s success? It’s an interesting story. For a long time he (Joaquin) went by the name Leaf. I’m the same age as his older brother, River Phoenix, and my younger brother is the same age as Joaquin and he’s called Leaves. How many seas must the white dove sail before she sleeps in the sand? I don’t get it – is that a reference to something? Getting back to the football – which team do you follow? Mainly the national team, but my local team is the LA Galaxy. If you could choose any player to play for them, who would it be? Well, my favourite player of all time is Landon Donovan, but he already plays for them. My younger brother. He actually had trials for them when he was younger. So no, Rivers isn't mental. He's rather nice. Result. I did feel like apologising about that Joaquin Phoenix question though. That was lame. Thanks, DiS reader. Alone – The Home Recordings Of Rivers Cuomo is released via Universal on February 4. Check out Weezer online at their MySpace page, here.